CIPM is one of the LARGEST pharmaceutical machinery industry shows in the world. 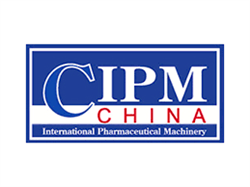 With 25 years of contributing to the Chinese pharmaceutical industry, CIPM has firmly established itself as the industry's must-attend show in China. Because of CIPM has a massive number of domestic visitors, more and more international exhibitors are coming to the show. The Exhibition will taking place from 19th to 21st of April in Qingdao. We are looking forward to your visit in Hall S2, on Booth S2-19-3.